South Yorkshire has a wide choice of great of days out for all the family. Military and history buffs can visit Robin Hood airport, formerly RAF Finningley, to see the world’s last operational Vulcan Bomber, sadly no longer flying. The Millennium Gallery in Sheffield showcases all sorts of metalwork including exhibits made in the city and around the world. The Winter Gardens in Sheffield city centre house over 2,500 types of plants in an amazing display. Aspiring scientists will enjoy the Magna Science Adventure Centre with a number of fascinating exhibits providing an educational experience for visitors. The Yorkshire sculpture park near Wakefield is filled with Henry Moore and Barbara Hepworth statues. There are a number of historic buildings, fortifications and castles in South Yorkshire. Conisbrough Castle is a 12th century partially restored castle which inspired Sir Walter Scott’s book, Ivanhoe. Roche Abbey is a ruined abbey set against the backdrop of a valley landscape designed by Capability Brown. If you are looking to escape to the great outdoors then head for the hills – walkers will enjoy the views from the hills, vales and moors of the countryside. Woodhouse Gardens are amongst other gardens in the county. There is plenty to do from a sporting perspective with football teams including Barnsley, Rotherham United, Doncaster Rovers and the two Sheffield clubs – Sheffield United, the Blades and Sheffield Wednesday, the Owls. The St. Leger horse race is run at Doncaster racecourse as part of the St. Leger Festival. And Sheffield’s The Crucible is synonymous with snooker. Looking for some retail therapy? Then take a visit to shopping centres of Crystal Peaks, Frenchgate Shopping Centre or Fox Valley Sheffield or the Lakeside Village at Doncaster. 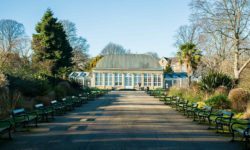 South Yorkshire’s famous names include journalist and TV presenter Michael Parkinson, former England goalkeeper Gordon Banks, actor writer and presenter Michael Palin, TV presenter Jeremy Clarkson, actor Sean Bean and Olympic star Jessica Ennis. South Yorkshire has a large range of annual events including the Dragon Boat Festival, Rotherham Heritage Festival, South Yorkshire Festival, Sheffield Food Festival, Tramlines Festival and a number of agricultural shows and food festivals. South Yorkshire’s famous food includes jelly babies and Liquorice Allsorts from Bassetts in Sheffield, Henderson’s Relish and lamb from the county’s hills – delicious with a Yorkshire pudding!